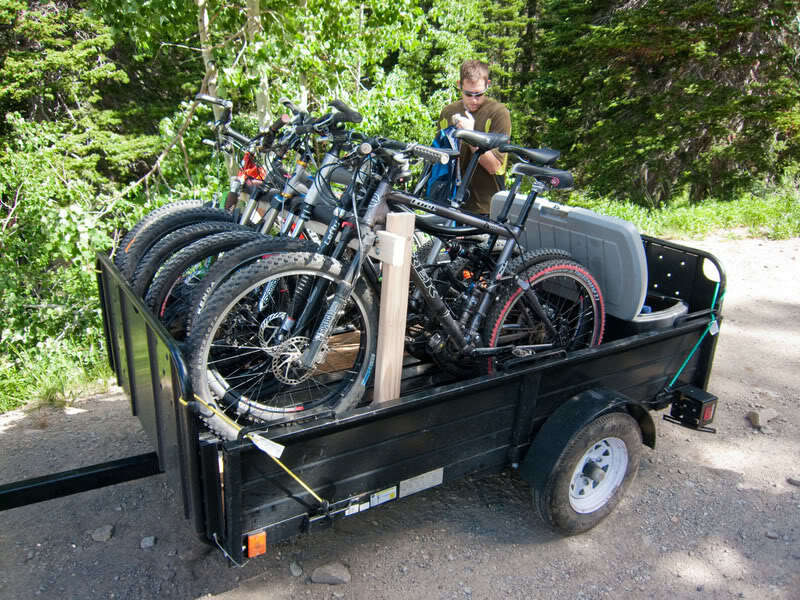 I just sold my truck and would like to make a minimal investment to be able to carry 5 bikes on a 5x8 utility trailer. 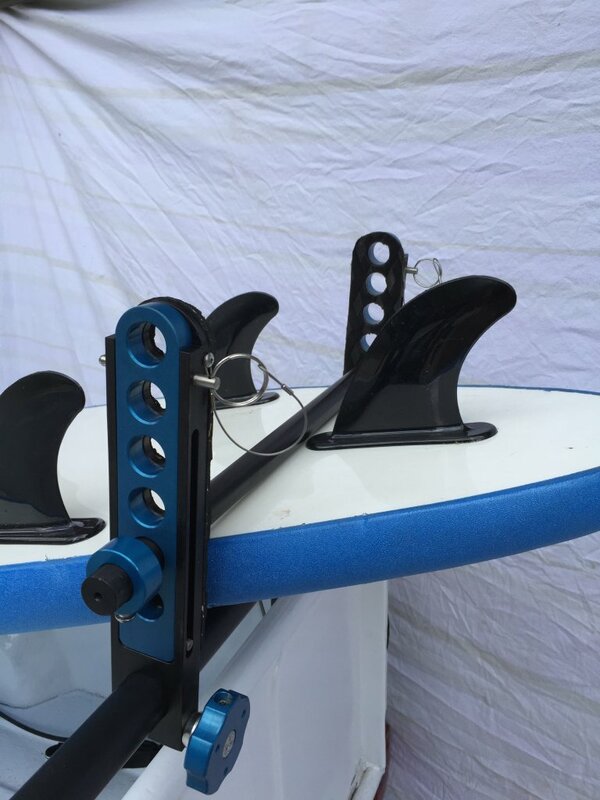 I already have a hitch mount 4 bike rack which works okay but I specifically wish to use a trailer because I am also towing a child trailer and don't have room in my jeep for the humans plus the gear - so I need the trailer. The floor is metal grid but I can easily put in a wooden floor to mount stuff too. I'd rather not buy a few hundred dollars worth of truck bed mounts from Yakima since I need 5. I also do not wish to remove front tires. I'm thinking there must be an inexpensive way to do this. 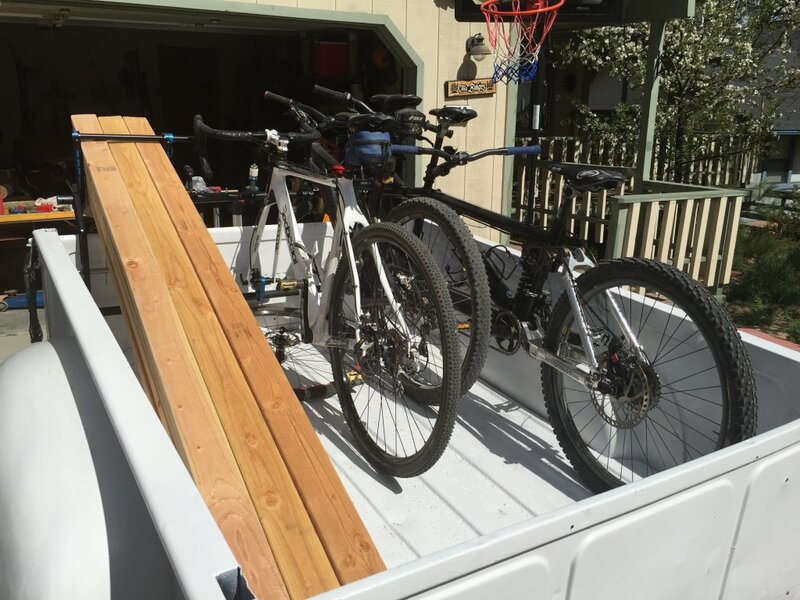 Something like a bike rack that you see in front of a school or commercial building that is mounted to the trailer and then some way to secure the rear tires. Any ideas? I found this photo online. 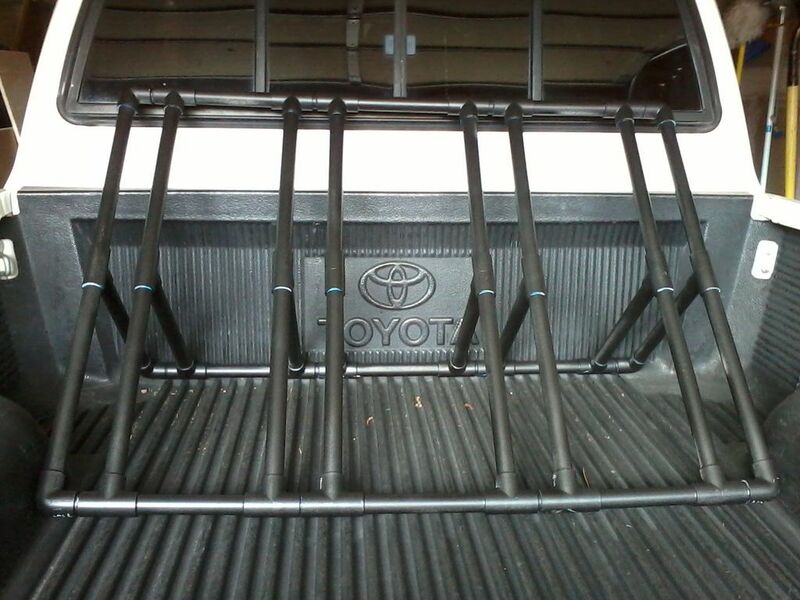 It looks like a rack like this could be a quick, inexpensive solution to your carrying needs. Thank you mr. Biker. I'm trying to find the full site with that photo to see if they offer any insights in to how they made it. 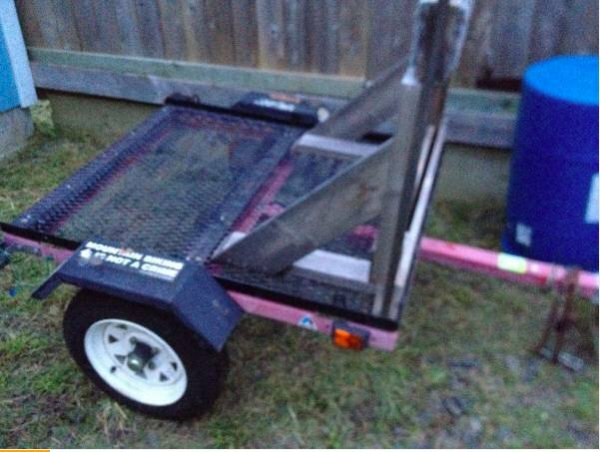 I have a 5.5 x 10 ft utility trailer with 3' high wooden sides. I also hang bikes over the side w/ front wheels (kinda like I do off the back of my truck tailgate) when I have a need to transport a lot of bikes. I have put 10 bikes on it that way before (scout group trail ride). The benefit there, I suppose, is that the trailer is useful for more than just bike hauling. 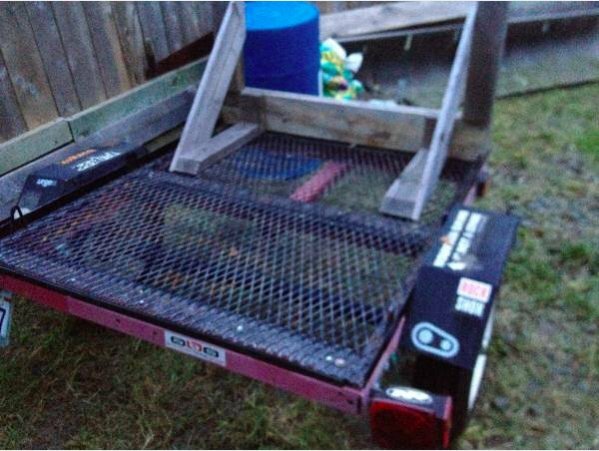 Another option would be attaching a truck bed mount to the trailer floor. This way the bikes can't bang into each other and nothing is touching the bike frames. All thanks for your ideas. Several things to consider. If you did something like the last image showing a rack in the back of a pickup. How would you secure the rear wheel? Would a tie down on each side of the bed (or trailer in my case) and a single heavy duty strap thread through all the tires terminating at the tie downs be sufficient? Personally, I'd rig up 2 of the above type racks, one at each end of the trailer. Slide the bikes in vertically. This will secure front & rear wheels. Secure the rear wheels with straps and you're all set. I mounted fork mounts, alternating down the sides of my 5x8 trailer. I used $15 mounts and metal binding found at the hardware store. It's worked well for years. I highly recommend putting them down the sides and not on the front or rear. Much easier to mount bikes that way. Here's how I did mine. It's 4, not 5, but 5 coulda worked if I needed it. holy crap..that yakima trailer is expensive!! super cool tho.. I'm in the same boat. I need to build one for 6 bikes. I seen someone on here put 4 on a 40x48 HF trailer. I would love to keep the trailer small for when the wife wants to take the kids while I'm at work. 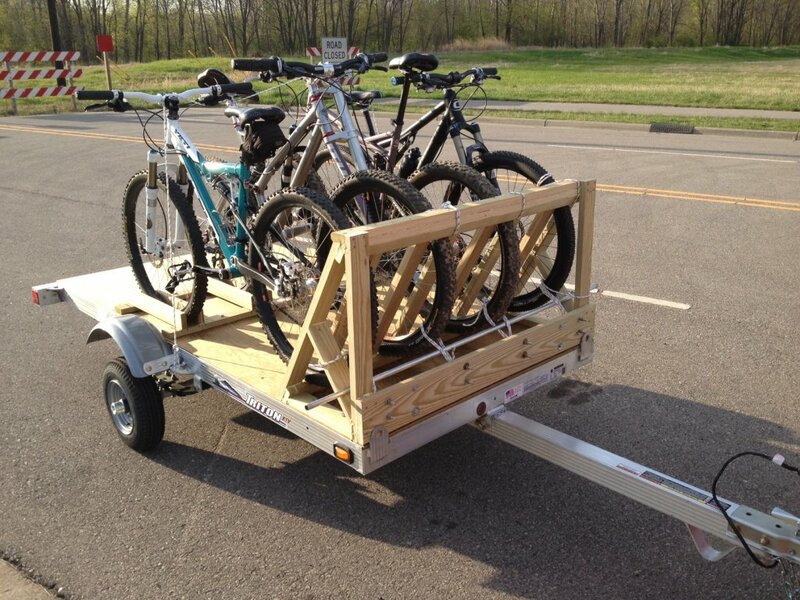 I want a trailer for bikes (and other) but I am phobic about the small wheel sizes that come with the light trailers. Any thoughts on the pros and cons of small wheels? 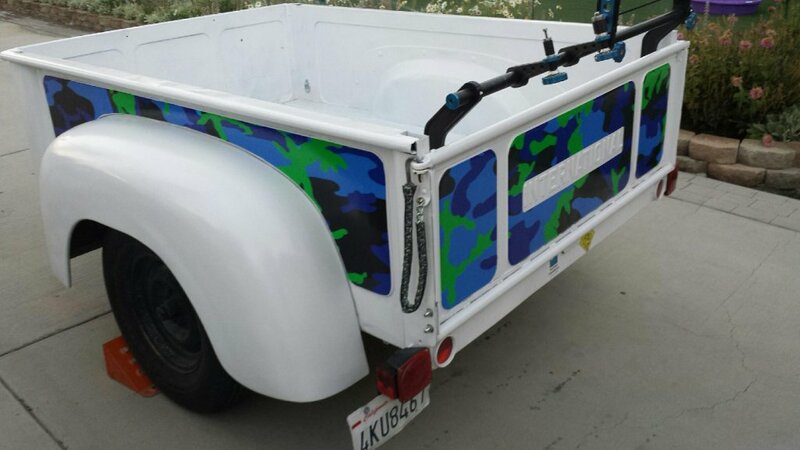 Heres my trailer I bought that was a little beat up, but exactly what I wanted for my MultiTaskr truck bed rack system to use as a display and to haul bikes, boards, kayaks etc, I've had 6 bikes mounted in the trailer. Its a 1955 International truck bed trailer that I picked up for $250 and then went on to put over $1000 for body work, paint and graphics, still looking for the wheels that Im going to put on it. Last edited by Hurricane Jeff; 11-10-2015 at 06:10 AM. 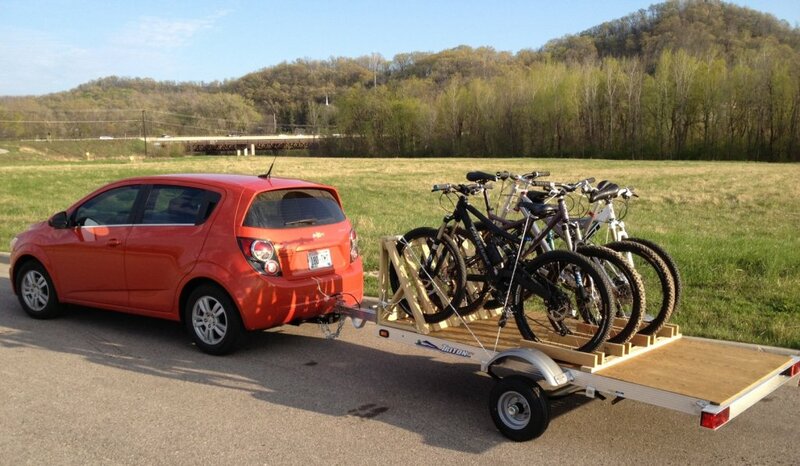 Back when I only had my '08 Prius to haul bikes, gear, and riders down dirt roads... I could only fit 2 bikes on the rack out back and one inside with half the split seat folded down. Left room for three people. It's been a great trailer and really easy to haul behind the Prius. Now... it was so light that I really didn't feel it back there. It was so small that I really didn't see it back there unless I had the bikes/rack or a high load on it. I did opt for the trailer with the 12" wheels, btw. Finally replaced my old undriveable truck with a new one and don't use the Prius to haul bikes anymore. Pics are from my CL ad where the trailer is listed for sale. Original costs were something like, $250 for the trailer and $40 or maybe slightly more for the metal, plus usual registration/license. Wood rack was scrap wood at the house. I hauled 4 bikes, plus riding and camping gear, and 3 guys, up into Oregon once for some lift-served riding. I got my money's worth out of it. 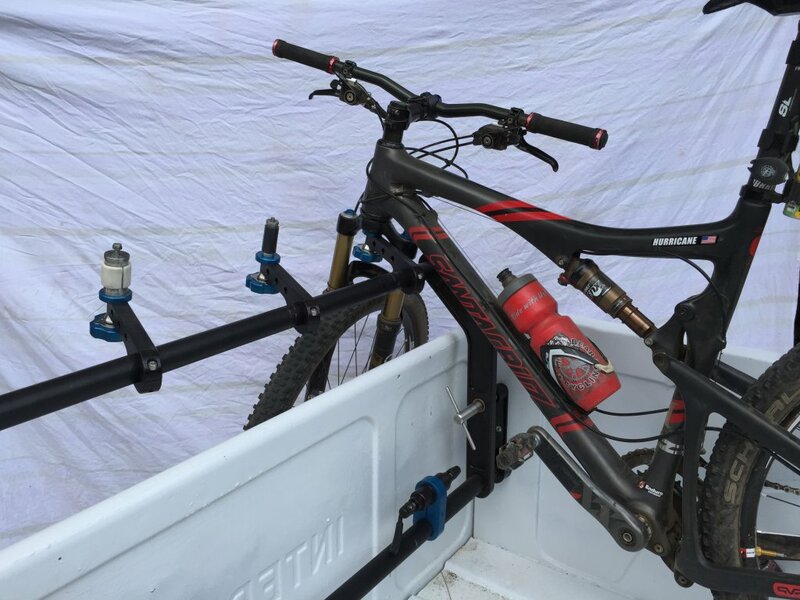 Anyone run a trailer on their carbon bikes? 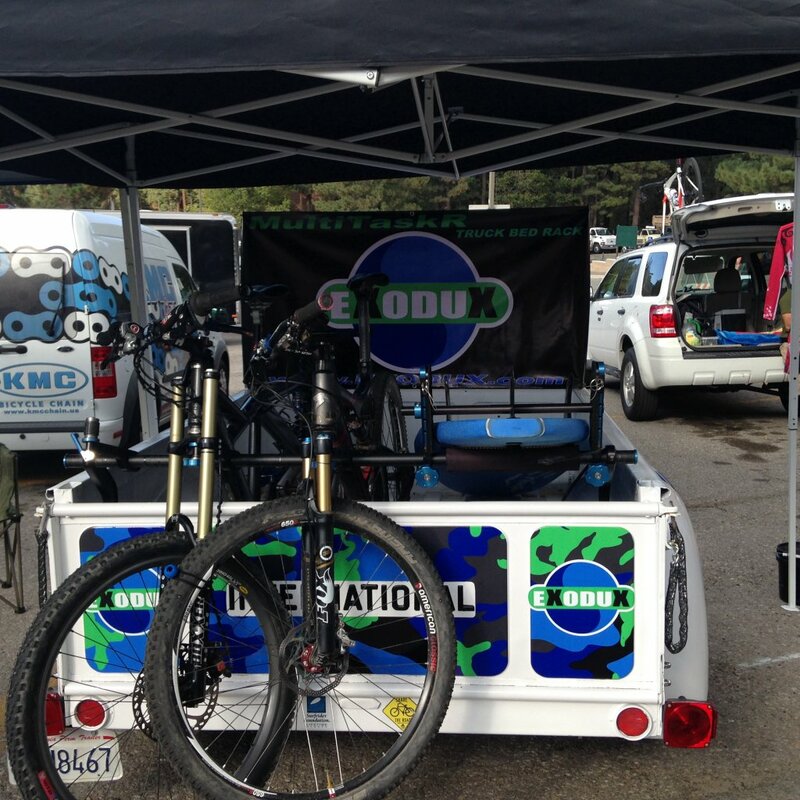 NE1 setup their Fatbike w/ a WeeRide Co-Pilot or any similar trailer?